As we continue to delve into the various styling aspects of jewelry cases as part of our “Jewelry Cases as a Great Christmas Gift”, we’re moving on to an important style aspect for standing jewelry cases or jewelry armoires, and that is leg design. 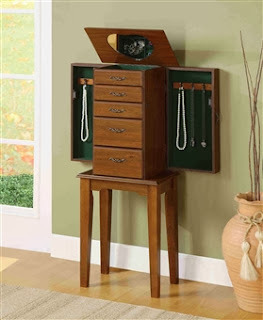 The most elegant floor model jewelry cases feature leg styles (meaning there is a 12 to 24 inch leg rather than the jewelry case extending all the way to the floor). For antique or more traditional designs, these legs are normally curved and end in a foot design. For example, Queen Anne designs feature Cabriole legs terminating mainly in snake feet. A very traditional design, usually reserved for very heavy cases, is the fluted leg, which is modeled from Greek columns and taper from top to bottom; the flutes are concave. Popular styles also include Saber legs or variations of the Saber leg. These designs splay outwards at the bottom and are thin yet very sturdy. They are normally associated with the early French Empire. Reeded and Spiral legs are similar in design and can be found on standing jewelry cases, but are normally reserved for heavier furniture. 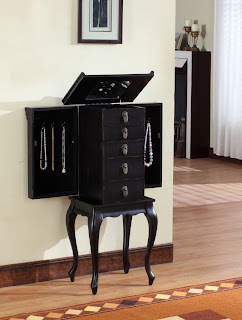 This can be a consideration when matching a jewelry case to existing décor. The most common designs for standing jewelry cases are variations of the Cabriole Leg with Claw & Ball foot, usually for more antique designs, to Saber Leg designs as more traditional but not quite antique, to straight leg designs that end in a block foot. These three shapes have stood the test of time for jewelry armoire designs. So as you shop, keep in mind that the leg style plays a significant role in determining what style will fit your bedroom!